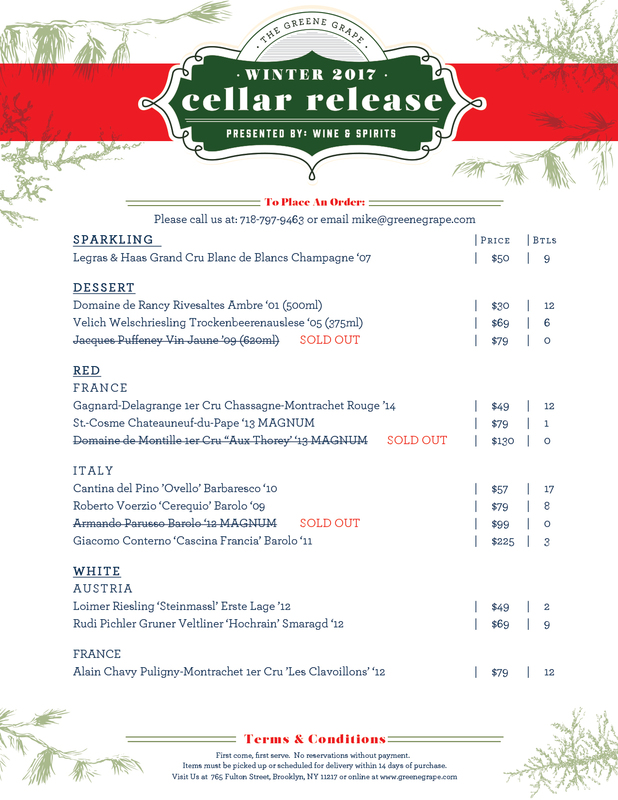 The holiday season is here and we couldn't be more excited to announce our 3rd Annual Winter Cellar Release - a seasonal collection of festive wines, each making the perfect gift or serving as the ultimate special occasion bottle. This year's offering includes an '07 Grand Cru Blanc de Blancs Champagne, three world class dessert wines, a stunning group of red wines from Burgundy and Piedmont, and two ethereal whites from the steep, cold slopes of Austria. But the crown jewels of the offering are three magnum bottles; a 1er Cru Nuits-St.-Georges, a Chateauneuf-du-Pape and a Barolo-- all stellar, all big, and each very limited. We are very proud of the offering that came together and we hope you enjoy. Please direct any questions you have to mike@greenegrape.com or call us at the shop (718) 797-9463.